Everyone loves Instant Pot, but the company’s cookers are so expensive. Even when they go on sale they still cost a pretty penny, so it’s always good to check out some of the other great options floating around out there. 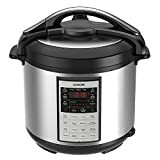 One of the best alternatives to an Instant Pot is the COSORI 8 Quart 8-in-1 Multi-Functional Programmable Pressure Cooker. It’s on sale right now for just $79.99, and it has even more features than the comparable 7-in-1 Instant Pot that costs $140!